It has a 5.2 full hd display .625 Qualcom processor.4gbram 32 GB internal and 12mp rear camera. It has a very good rear camera dual tone technology. Even though it has a metal body it doesn&apos;t heat much.i found 42_43 c max temperature. It has only one speakers with some low quality sound comparable to g2/g3/g3. Not so much work is done with selfie cam, even though it is 5mp. It has no compass sensor that&apos;s one of the big drawback. The battery life is amazing. It&apos;s been a week since i bought this phone and I&apos;m very satisfied. The phone is very customisable. It&apos;s very easy to use. It looks elegant as well and the camera is also great. I would highly recommend everyone to just go for it. I am in love with it. Worst video recording. It gives noisy sound in recording even in a complete silent..i am regretting now for buying this phone. Please don&apos;t buy if u r looking for a good video recording. Your search for a flaunt-worthy, feature-rich smartphone ends with the Moto G Plus (5th Gen). With a captivating design and an exceptional camera, this smartphone will change how you look at mobile photography. Rear camera : Low light photo and normal photo is excellent and video recording is nice in 4k and slow motion video is also good. Its main feature is its dual alpixel auto focus which makes easier to capture any moments very fast. This is the main attractive feature of this phone as its camera is the best camera within 20k range. Design: gives a professional look with a classic finish. Ram: Normally it uses 1.6GB of ram out of 3.6GB and also it operates like a butter. Heating : It doesn&apos;t heat at all even on LTE network. Battery: It&apos;s battery can be of more capacity ( it has 3000 mAh) in this range. But for normal usage it gives around a day backup easily so still no problem. Speakers: It doesn&apos;t have a speaker separately i.e the speaker for the phone calls and for loudspeaker is same. Earphones: As usual moto gives the most cheap quality earphones. I am currently using this model. It is good and charges fast. 2.This phone is able to run Two Apps Simultaneously. 3.Corning Gorilla glass 3 Protection. 1.Headphone quality is not up to the standard level. 2.It doesn&apos;t have LED notification indicator. 4.Headphone quality is not good. One of the best phone which is an absolute beast (with specs) with beauty (aluminum) premium finish. 39 Pricebaba users have written their experience with Motorola Moto G5 Plus (4GB/32GB). If you own Motorola Moto G5 Plus (4GB/32GB), please do leave your feedback too. Lowest price of Motorola Moto G5 Plus (4GB/32GB) price in India starts at Rs. 9,950 Motorola Moto G5 Plus (4GB/32GB) is available on Amazon at Rs. 9,950. Prices updated on 23rd April 2019. 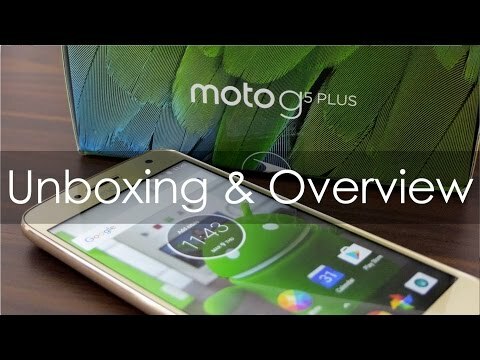 The Moto G5 Plus has to be one of the most anticipated budget phones of 2017. The successor to the Moto G4 Plus, the smartphone already has big shoes to fill. The smartphone is the second device bearing the Plus naming in the G series from Motorola. To start off, the Moto G5 Plus sports a 5.2-inch display with a resolution of 1920x1080 pixels. This translates to a pixel density of 424PPI which is quite better than the Moto G4 Plus which was at 401PPI. This is also because the G5 Plus has a smaller screen than its predecessor (5.2-inch vs 5.5-inch respectively). The smaller size makes the Moto G5 Plus easier to hold in the hand. Motorola has also opted for a metal build finish on the phone giving it a premium feel. The Moto G5 Plus is powered by a Snapdragon 625 processor and comes with 4GB of RAM. This particular processor is one of the most efficient chipsets on the market. It is found in other phones like the Moto Z Play, Lenovo P2 and Asus Zenfone 3 (5.2-inch) which are expensive in comparison. The phone also packs in a 3000mAh battery which would result in one day of battery life. So if battery is a crucial point when you look for a smartphone, the G5 Plus is well sorted. The smartphone runs on Android Nougat along with Motorola customizations onboard. The company is known to have good software additions and a good track record for pushing software updates. Purists will love the near stock UI on the phone. The Moto G5 Plus sports a fingerprint scanner on the front which helps keep the device secure. The phone has a 12-megapixel camera at the back along with PDAF and dual LED flash. On the front, the phone has a 5-megapixel selfie camera. The phone has 64GB of internal storage that is further expandable. It is a dual SIM device and has support for 4G and VoLTE. It also comes with the standard connectivity options like Bluetooth, Wi-Fi and NFC connectivity. The G5 Plus is said to be waterproof and will be able to withstand a dip in the pool without failing on you. Ans: Yes Motorola phones usually get quick Android updates and this phone shall be no exception. Ans: No, the 3000mAh battery of the phone is not user removable.